You are learning about Eureka Stockade. Do you know where this event took place? In Ballarat, Victoria, Australia. Have you learnt about Peter Lalor who became one of the leaders of the Ballarat Reform League? What country did he come from? How did he get to Australia? Look up Peter Lalor in the eurekapedia.org This is how to find information about Peter Lalor. On the bottom left hand side there is a photograph of four men. This photo was taken on the 50th anniversary of Eureka, in 1904 when there were huge celebrations in Ballarat. Click on “Biographies” (HINT: under the photograph of the four men) This will bring up a photograph of all the old men and some of the women who fought at Eureka. Some of their names are under the photograph. Under the names you will find an alphabet list. Scroll down. Peter Lalor’s name starts with “L”, so click on “L”. Scroll down and find “Peter Lalor” (HINT: He is fourth on the list) Click on “Peter Lalor” Here you will find pictures of Lalor, a photograph of his gun, and lots of information. 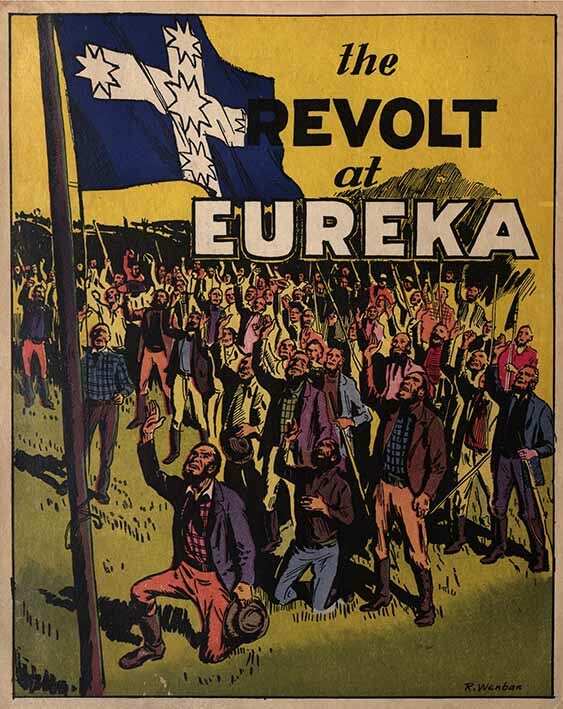 The Links between studies about the Eureka Stockade and the History and Civics and Citizenship AusVELS Domains are clearly evident and are listed under History AusVELS Levels and Links to Eureka. AusVELS provides a single curriculum for levels F-10 that incorporates the Australian Curriculum as it is progressively developed within a framework that reflects particular Victorian priorities and approaches to teaching and learning (F is the abbreviation for ‘Foundation’ which is now the common term agreed to by all States and Territories to refer to the first level of school for curriculum design purposes). AusVELS has been designed to ensure that schools and teachers are not required to manage two different curriculum and reporting frameworks during the development of the Australian Curriculum. 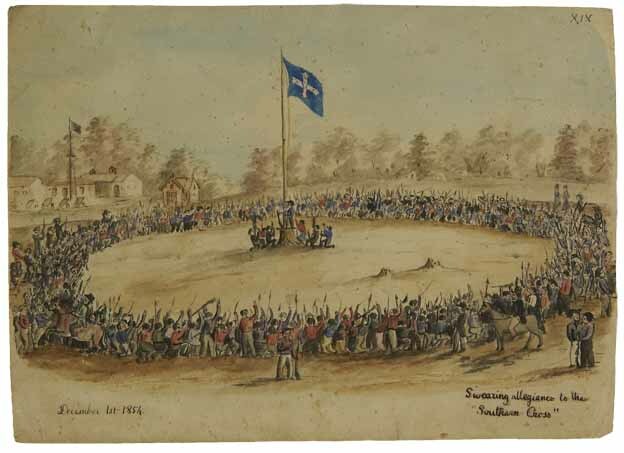 Links between studies about the Eureka Stockade and the History and Civics and Citizenship AusVELS Domains are listed below. Key figures and events that led to Australia’s Federation, including British and American influences on Australia’s system of law and government. The contribution of individuals and groups, including Aboriginal people and/or Torres Strait Islanders and migrants, to the development of Australian society, for example in areas such as the economy, education, science, the arts, sport. Civics and Citizenship Learning focus As students work towards the achievement of Level 8 standards in Civics and Citizenship, they study the origins of democracy and various other types of government in an historical context. They learn about how past societies such as Ancient Greece and Rome have influenced modern democracies. They learn how Australian democracy developed from an autocracy to a modern democracy and the British foundations of Australian democracy. Students learn about significant milestones in the development of Australian law, governance and rights. They explore the historical origins of some political rights, such as universal suffrage, secret ballot and payment of parliamentarians. They consider examples of the fight for political rights such as the Eureka movement, the eight-hour day and fair working conditions, Aboriginal and Torres Strait Islander rights and the vote for women. They look at the origins of Australian citizenship and how it can be acquired. Students learn about key features of Australian democracy. They learn about the two houses of the Australian parliament and the ways that citizens are represented in the Senate and the House of Representatives. They compare the roles of federal and state parliaments. They learn about the general processes of elections in Australia. They consider the separate responsibilities of the three levels of government and the impact of each level on the daily lives of citizens. They develop understanding of aspects of political parties and their leaders, the role of the Australian Constitution, and the courts. They discuss examples in the media of people, laws, and issues concerning these features of democracy. Students consider the English origins of Australia’s legal system and the origins of common and statute law. They learn about the purposes of laws and consider examples of the process of making and changing them. They evaluate the merits and successes of the principles in Australia’s legal system such as justice, the presumption of innocence and equality before the law. They identify the requisite conditions for a fair trial. Through historical and contemporary examples, including those from Australia, students are introduced to the values and qualities of leadership. Students are provided with opportunities to take on a variety of leadership roles. They develop skills required for active and informed citizenship and use these in class and community contexts. For example, they use cooperative decision making to design and evaluate a group project, seek a variety of opinions and use a voting method to determine the majority view about an issue. Students examine the ways in which Australians are connected to other people in the Asia–Pacific region and around the world. They explore the responsibilities of global citizenship for individuals, organisations and governments and the roles and responsibilities of companies, producers and consumers in relation to sustainability. They explore ways in which countries work together to protect the environment. Students interact with a variety of groups and organisations in civic and community events. With assistance, they seek opportunities to actively engage in school, local and community events. They research issues and events of importance to the community, recognise a range of perspectives, and propose possible solutions and actions. These issues may be related to matters such as environmental sustainability, social justice and human rights and may have local, national and global significance. Standards Civic knowledge and understanding At Level 8, students explain the origins and features of representative government. They identify significant developments in the governance and achievement of political rights in Australia. They explain key features of Australian Government including the responsibilities of the levels of government, the houses of parliament, political parties and the ways that citizens are represented, using some contemporary examples in their explanations. They describe the purposes of laws and the processes of creating and changing them. They identify and question the features and values of Australia’s political and legal systems. They identify and discuss the qualities of leadership through historical and contemporary examples. This page was last edited on 21 May 2018, at 09:54.